Awoke to another stunningly beautiful morning. So gorgeous in fact that Al decided to spread the yoga mat on our picnic table to do his stretches and exercises outside rather than in bed as he usually does. We thoroughly enjoyed staying here for two nights, but it’s now time to move on. Al packed up all our toys (bikes, kayaks & accoutrements) last night so this morning after breakfast we pumped out, filled our water tanks, took showers and headed to the local Internet Café/General Store/Visitor Info Center. This place, out here in the middle of nowhere, was a veritable hub of activity. It would have been fun to hangout and just watch and listen for a day. Before long we would have known about everything occurring within a 100 mile radius. Conversely, we just had a cup of coffee and downloaded our email. 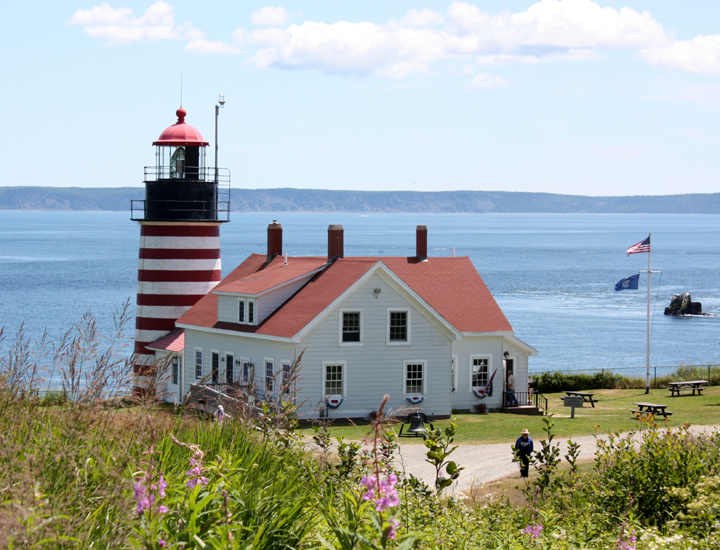 We drove towards Lubec and the Canadian border to visit the easternmost point of land in the continental United States at Quoddy Head State Park and lighthouse. Together Al and I have now visited the southernmost (Key West), westernmost (Washington State) and easternmost. All that’s left is the northernmost in Minnesota. Not sure if I will put that on my bucket list though. We crossed the Canadian border onto Campobello Island without incident. We called a local contact from BoondockersWelcome.com and a very personable gentleman came right down to meet us and lead us back to his house, where we camped in his front yard. Boondockers are RVers who look for places they can camp for free and this website now lists RV owners who welcome others to stay on their property. This particular one is a real find. Peter and his wife Beatrice own a local tour guide company so I don’t have to study brochures to figure out what we want to do here…bonus! 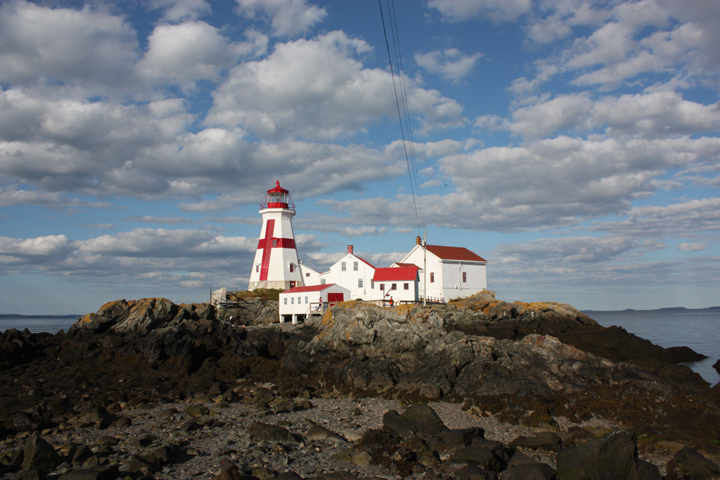 At the time of today’s evening low tide they took us out to the East Quoddy Head lighthouse (the light earlier today in Maine was West Quoddy Head). The tide must be low to access the light. To do so we hiked over rocks, across beaches, up and down 3 staircases, and over a bridge. It was well worth the hike, plus we were happy to get the exercise. This lighthouse, like so many others, has been saved by volunteers who work constantly (weather permitting) to restore and maintain the property. The maximum tide differential here is over 26 feet! 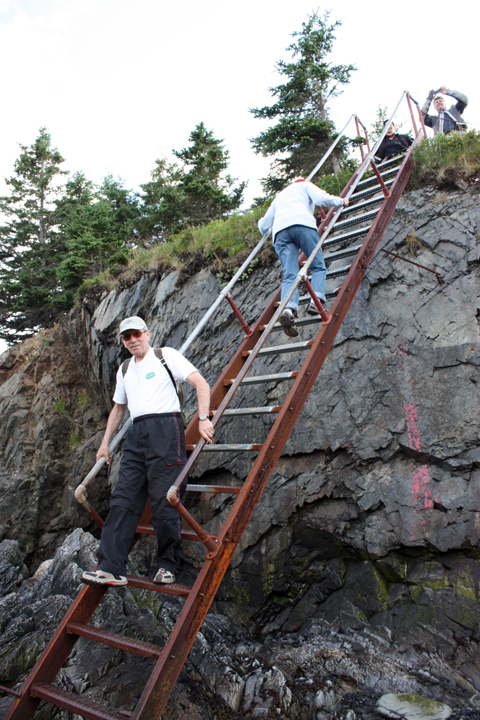 So far these radical tides have worked in our favor – first for kayaking and tonight for our lighthouse hike. We are only here until tomorrow afternoon, so we could very well have missed this opportunity. Even our hosts have only been out there twice this season.